In Brief: Travel by foot, camel, and jeep through the Alashan Desert to reach a beautiful Buddhist temple deep in the dunes. 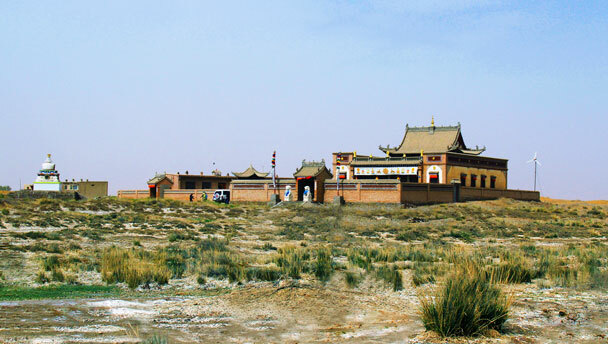 Includes a night camping in the desert, plus a visit to the Western Xia Imperial Tombs. Travel by foot, camel, and jeep through the Alashan Desert to reach a beautiful Buddhist temple deep in the dunes. As part of this trip we’ll do a two-day trip through the desert to a temple. We’ll visit lakes and oases surrounded by huge sand dunes, camping overnight by one of the lakes and getting a look at the sparse lifestyle of desert-dwelling nomads and shepherds. 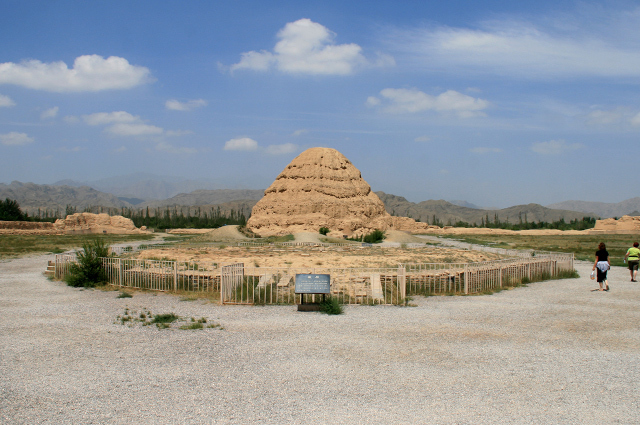 On the last day of the trip we’ll visit the Western Xia Imperial Tombs, taking a look at the distinctive pyramid-shaped burial mounds left by a kingdom that was extinguished by Genghis Khan. Note: This trip has quite a bit in common with our Tengger Desert Lakes trip. Built over several decades and finished in 1739, Chengqing Temple is a Tibetan Buddhist temple, and there’s a mysterious legend that connects its construction to the Sixth Dalai Lama. By many accounts, the Sixth Dalai Lama, Tsangyang Gyatso, was not particularly suited to his position. The death of his predecessor was kept secret for 15 years; it took a three-year search to find the new incarnation, a two-year old son of nobility, and then the next twelve years had to be spent getting him to the point where it could be revealed that the Fifth had become the Sixth. But it seemed like even twelve years’ training was not enough, and the young fellow turned out to be more interested in life outside the Potala Palace, going out drinking and consorting with young women, and writing what’s said to be excellent poetry based on his escapades and standard teenage angst. Around the same time, the Kangxi Emperor of the Qing Dynasty was backing a Mongolian king who wanted to take over Tibet. To make that long story short, the Sixth Dalai Lama was sent to Beijing for an audience with the Kangxi Emperor, who was going to decide what to do with him. And this is where the legend begins. One version of history has the Sixth Dalai Lama being killed in 1706, on the way to Beijing, and being replaced in Lhasa with a fake Sixth. Another version of the story, though, has him escaping mid-route and ending up in the desert, where he got back on the Buddhist straight-and-narrow middle path. He oversaw construction of the Chengqing Temple and spread Buddhism throughout the area, eventually passing away at the temple in 1746. On the third day of our trip, we'll end up hiking through the sand dunes to reach the temple. A tiny settlement by a lake, deep in the Tengger Desert. 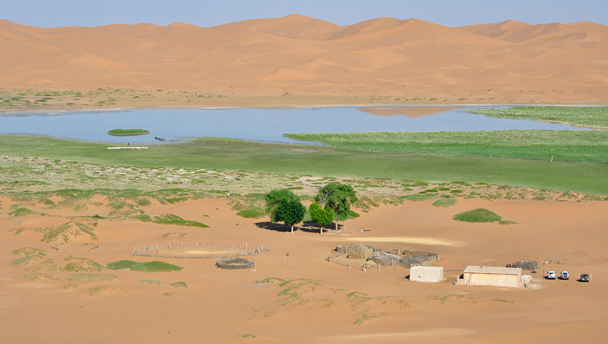 Somewhat surprisingly, more than 500 fresh- and salt-water lakes and oases can be found in the Alashan Desert. On this trip we will visit or pass by Moon Lake, Yellow Grass Lake, and Toudao Lake, where we will set up camp. 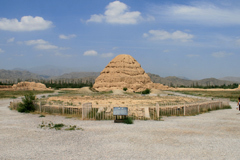 The Western Xia Dynasty (1036–1227 AD) was completely extinguished by the Mongolian army of Genghis Khan and his sons, leaving only the pyramid-shaped tombs of the early kings. The story of the Western Xia is interesting—a fierce beginning, consolidation of an empire, then a gradual decay due to scheming and corruption, and then an extended finale featuring 20 years of attacks by the Mongolian army, during which it’s said Genghis Khan received a mortal wound. The site of the tombs features an excellent exhibit that uses life-size models and murals to tell the entire story. The temperature in deserts will usually vary greatly between the night time and daytime. In September it's dry and we expect daytime temperatures of around 10-20°C, with temperatures as low as 4°C at night. Please be prepared to dress warmly. It is not expected to rain, although rain is not impossible. At this time of year, the chance of sandstorms is low, but we still need to be prepared. 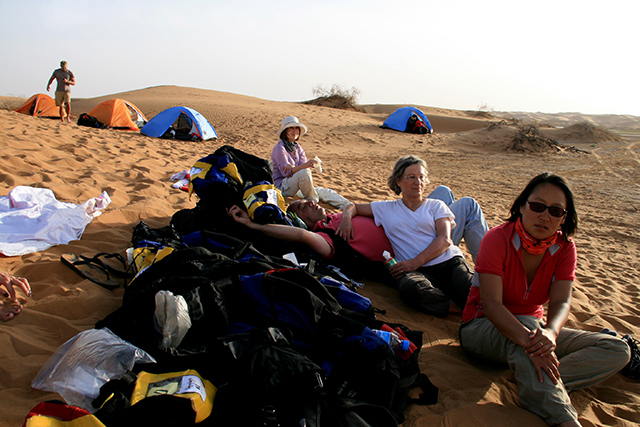 Simple breakfast and picnic lunches will be provided on two days in the desert, as will dinner at camp on day two. At other times, we will take our meals at hotels or restaurants in Bayanhaote, or in Yinchuan. Bring some spending money for snacks during the trip. We’ll be eating Chinese-style food. Please let us know if you have any special dietary requirements or food allergies. 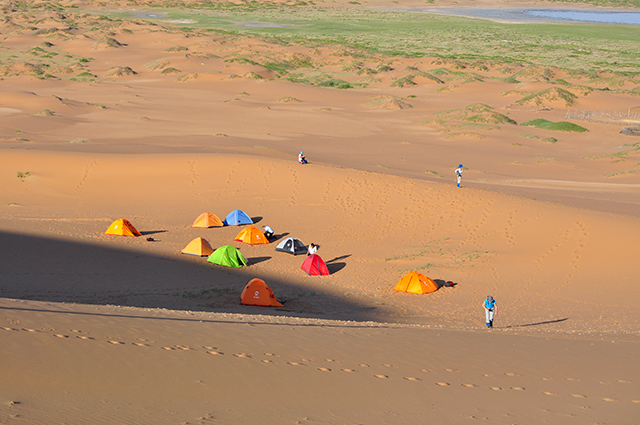 Photos from our June 2012 visit to the Tengger Desert. 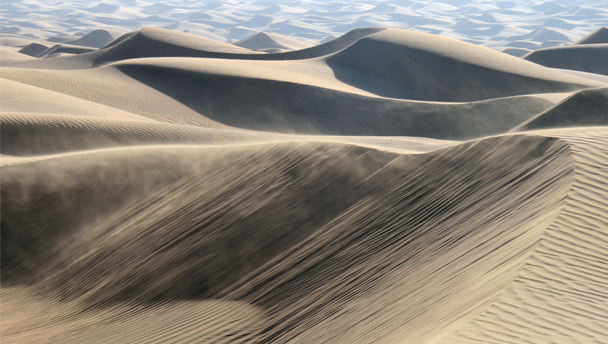 Photos from our May 2012 visit to the Tengger Desert. Photos from our August 2011 visit to the Tengger Desert. 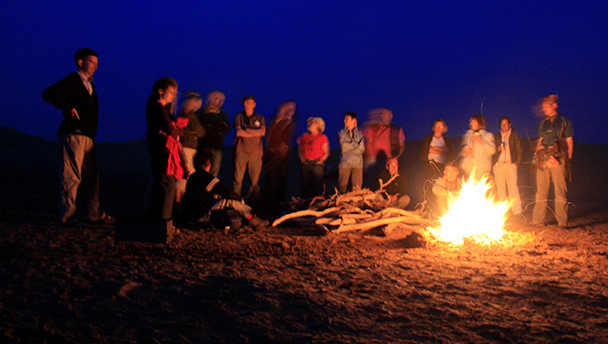 Relaxing by a bonfire at a desert campsite. Forty-six photos from our trip into the Alashan Desert in Inner Mongolia. We made a mission into the Alashan Desert, travelling by foot, camel, jeep, and boat (!) to find a temple in the middle of the dunes.